Kyocera-Mita has just launched eleven new monochrome and color A3 MFPs and has topped up its A4 range too, with eight new monochrome and color A4 MFPs. Based on a common platform, the new TASKalfa 3500i, 4500i, 5500i, 6500i, 8000i (B&W) and 3050ci, 3550ci, 4550ci, 5550ci, 6550ci, 7550ci (Color) all have the same touch-sensitive screen, the same paper trays and the same finishing modules (adaptable and interchangeable to suit customer wishes according to model). Beyond lending some uniformity to the A3 range, the brand is playing on the long lifetime of its new ceramic drum (600,000 pages) and its new customizable accounting package which can adapt to the color coverage rate. On the A4 side, Kyocera-Mita is launching the FS-3040/3140MFP+ and the FS-C2026/2126MFP+. These are new models with better environmental credentials. 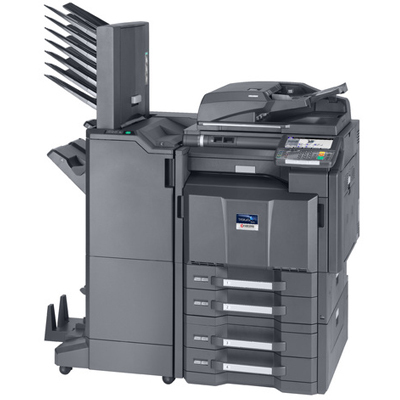 Also launched are four other new models with equivalent speeds: the FS-3540/3640MFP (40 ppm) and the FS-C2526/2626MFP (26/26 ppm).